Ben España, bass, (b. 1991) is an award-winning composer and singer residing in Portland, OR. As a bass-baritone, he has been featured as a soloist throughout the Northwest, specializing in opera buffa, early music, and oratorio; choral singing, however, has continued to hold a special significance in his life, and he continues to sing with Portland Vocal Consort, the St. James Collegium Musicum, and occasionally Portland Symphonic Choir in addition to Cantores in Ecclesia. 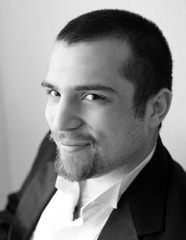 In May of 2013, España accepted the position of Associate Conductor of the Oregon Repertory Singers, a job which he will begin in the Fall while studying for his M.M. in Choral Conducting at Portland State University.